Delphi at Mount Parnassus, Greece. 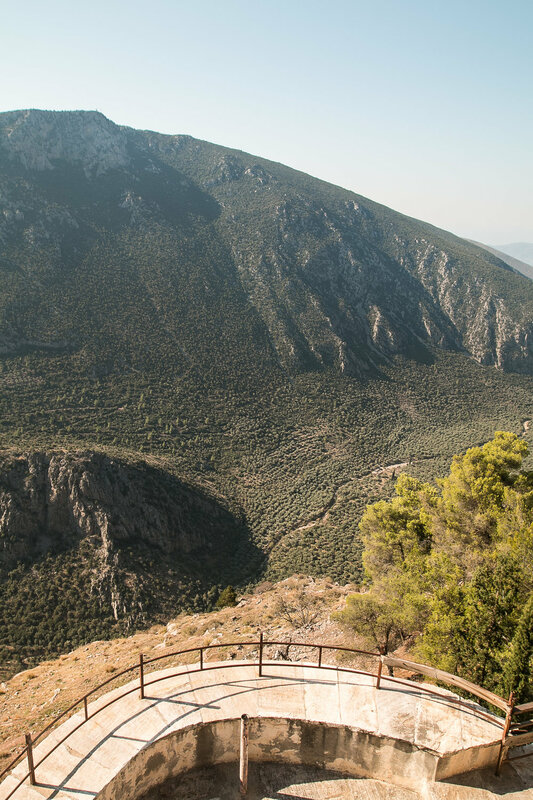 Delphi, located at the south-western slope of Mount Parnassus, was considered the apex of spiritual mysticism during the Ancient Greek era. Dedicated to the Greek god Apollo, the most notable aspect of Delphi wasn't the temple or alms given up in offering to Apollo, but the gift that he had left there in his wake; Pythia, the first oracle. Etymologically named after 'Pytho', Greek for python, Pythia gained her name from the giant snake that was slain and buried at the site by Apollo. Though, this was later changed as Pythia was soon regarded simply as the "Oracle of Delphi", with succeeding mediums (more like young, beautiful virgins) taking up her mantle. Famed for her uncanny ability to peer into the future, an audience with the oracle was only granted to successful consultants (literally, "those who sought counsel") and followed a specific four-stage process, common among shamanic journeys. (1) A journey to Delphi, in which supplicants were motivated to take the long and arduous task of actually going to Delphi, (2) Preparation of the Supplicant, where Supplicants were interviewed by priests in preparation to meet the Oracle and their questions were re-framed in a specific manner. Additionally, they were also made to carry laurel leaves along the 'Sacred Way' on their path to visit the temple, (3) A visit with the Oracle, where the supplicant would present their question, receive an answer and promptly leave, (4) Return home, where the advice received by the Oracle was meant to be implemented and, thus, shape future outcome. Though this procession of events and the Oracle's predictions may sound ludicrous, oftentimes the Oracle's predictions were found to be correct! However, correlation is not causation, and the means by which the Oracle would draw her predictions was by inhaling a large amount of what is now believed to be ethylene gas*. Once inhaled, the Oracle would slip into a crazed epileptic seizure, uttering nonsensical words which the high priest was made to decipher. Objectively speaking, it makes you wonder who was actually in charge of predicting futures; the Oracle, the high priests, or the persons themselves? Either way, the true change-agent for all future events is really governed by our own ability to "believe". The Temple of Poseidon in Sounion, Greece.